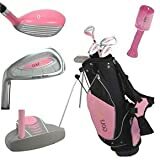 Clubs: Driver wood with extra loft for easy hitting, Oversized Ti-Matrix perimeter-weighted irons with large, forgiving sweet spot - 5 iron, 7 iron , 9 iron, Pink Ball Putter & pink longneck headcover for the driver. Stand Bag: DELUXE junior stand bag with double shoulder strap, 4 way divider, 4 exterior pockets, umbrella holder, Velcro glove tab & rain hood. Color is pink & black. 4-7 year Set Lengths: Driver (36"), 5 iron (31"), 7 iron (30"), 9 iron (29"), putter (27.5") 8-12 year Set Lengths: Driver (39"), 5 iron (34.5"), 7 iron (33.5"), 9 iron (32.5"), putter (31") Pink Graphite Shafts- Junior Flex Soft wrap grips (color is black) For Girls between 4-7 years of age up to 4'6" (54") and 8-12 years of age 4'6" in height and up 5'2"
The Flora Girls Combo is a great set that will get young girls ages 4-7 and 8-12 involved in the game of golf. 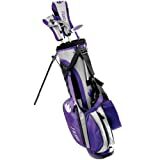 This girls purple combo features a stainless steel driver, hybrid long iron, mid and short irons, and a matching putter. Right Handed, Headcovers included, Graphite shafts, Matching stand bag. 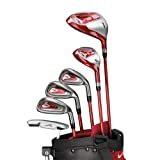 The Nike VRS (Right-Handed) Kids' Golf Club Set 52" to 61" offer young players a total package of high-tech performance gear for improving their game in a lightweight, specialized carrying bag. A driver, hybrid, #7 and #9 irons, sand wedge and putter are included in the set. 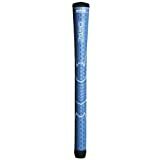 Graphite shaft and rubber grips provide durability and an controlled swing. Lightweight, durable stainless steel head and graphite shaft delivers high moment of impact. 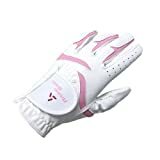 Get your game on with the Nike Dura Feel golf gloves. Features enhanced synthetic leather and leather patch on palm and thumb provide a great grip and optimal mix of feel and durability. Perforated synthetic leather panel on back of hand for enhanced breathability and a better range of motion. Strategically placed Lycra spandex in fingers and back of hand for flexibility and breathability. Angled tab design for a superior ergonomic fit. Customized fitting system for all hand shape and sizes. Millions of kids are getting into golf all over the world. Golf offers your kid unparalleled opportunities - world travel, money for college, great career choices. However young players sometimes suffer burnout, injury, and other specific problems, ruining their love of the game and desires to keep playing. How to motivate kids to go back, practice after practice. When to focus exclusively on golf. Save on lessons, find scholarships and sponsors. How to pursue college golf and a career in professional golf. Gain insight into golf organizations and agents. Have fun along the way at the best golf camps and resorts. Golf Guide for Parents and Players unveils the secrets of success for junior and college golf, the professional tour and beyond. Whether your kid is 2 or 18, just starting, has played some golf, or is already a champion - this book will provide a chockfull of practical answers and new ideas. HT Max-J junior sets and clubs for boys and girls offer high-flying technology that makes playing golf fun - and they're backed with the Tour Edge Lifetime Warranty! The best value in junior golf, HT JMax sets are available in three configurations and include a lightweight stand bag:.